The National Trust’s Research & Policy Lab is the next generation of the Preservation Green Lab, expanding our research and policy innovation to issue areas beyond the original scope of environmental sustainability. The Lab conducts innovative research and develops new policies to help conserve and reuse older and historic buildings. The Lab’s ground-breaking reports provide data and analysis on the connections between older buildings and a range of positive economic, social, and environmental outcomes. The Lab maintains a national database of information about buildings in cities across the country and partners with preservation and community leaders to leverage their built assets to support more inclusive, healthy, and resilient communities. Adaptive reuse should be the default, and demolition the option of last resort. More on our ReUrbanism initiative. The Research & Policy Lab challenges long-held beliefs within the preservation movement through big data, mapping, and spatial analysis. 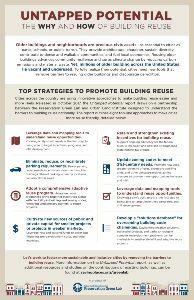 Our groundbreaking research uses the language of developers, city officials, and policy makers to make the case that building reuse can and should be promoted as a tool for sustainable development. In recent years, sustainability has come to mean more than simply being environmentally responsible. Older buildings and blocks are a key component to creating successful cities and neighborhoods – historic fabric creates economically vital, socially equitable, and strong, resilient neighborhoods. Reusing and retrofitting vacant and underused buildings across the country will help cities become more sustainable while meeting changing market demands. 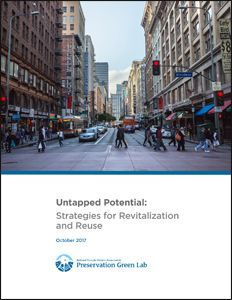 To help make this process easier and more likely, the Green Lab has developed policies and tools that can unlock development potential in cities across the country.